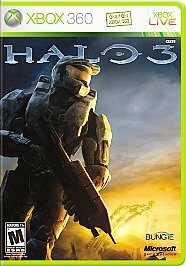 Halo 3 is perhaps one of the most well known games for the Xbox 360. With excellent graphics that makes most Wii and PS3 owners break down and cry, an awesome online interface that allows you to voice chat with your buddies while you shoot them, its easy to see why. Graphics-wise, Halo 3 gets a 10/10. The graphics roll smoothly, with little to no framing. Plus the artwork is better then most games. Sound-wise, it gets a 9/10. Sound can crackle at times, but not too badly (Should go un-noticed). Multiplayer-wise, this game scores 9/10. This game is truely a multiplayer game, with barely any lags in the Wi-Fi, except maybe with the voice chat breaking up every now and again. Controls-wise, this game gets a 10/10. Some dang nice controls that make an awesome game even awesomer (Hah! That's a word, you know). Overall, this game gets a 9/10. Not too shabby, eh? If you beat every level of the game on the "Legendary" game mode, you can unlock extra content on Xbox Live, which includes a video on the making of the game and concept art.